Paris Shoes at 51 W. Hastings, in Vancouver, possibly 1919. 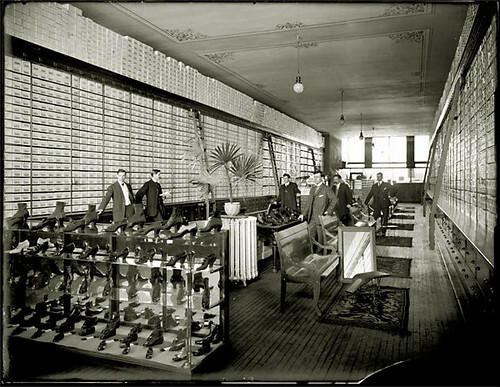 Maybe if shoeboxes still looked this beautifully white you wouldn’t have to have salespeople constantly disappearing into the back. I somehow doubt that the uniform whiteness of this bank of shoe boxes could every happen again, though, and if it did it would be twee rather than pure utility. 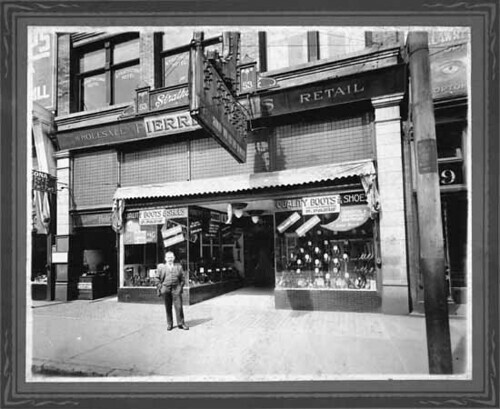 In 1945 this shoe shop was still in operation, and that is Pierre Paris in front of it, below, just after the end of the war. 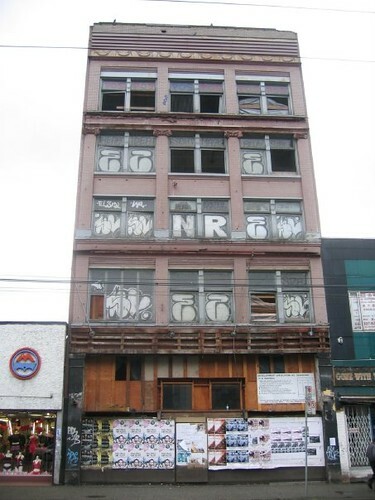 Like so many buildings in Vancouver’s Downtown Eastside, the building fell into disrepair (see bottom) over the past few decades and was condemned. But it has been gutted and saved and has just been turned into condos, harbinging gentrification for an area that is more ragged now than it was when Hastings Street was the logging skid road that gave birth to the term skid row. My friend Alan has opened a nice diner where the shoe shop used to be, the Acme Cafe. 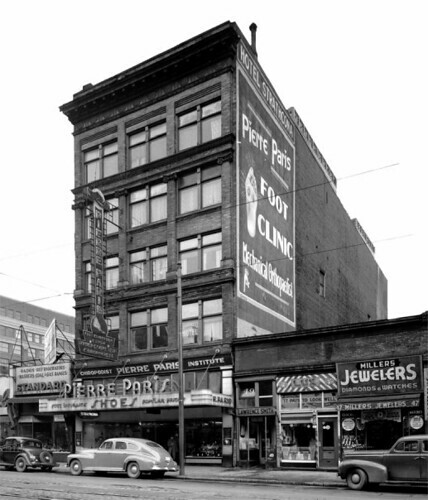 … For over 60 years The Paris Block was home to Pierre Paris & Sons – a logging boot manufacturer and shoe retailer. Today, the Paris family company continues as Paris Orthotics on West 4th Avenue. Originally built in 1907, The Paris Block is unique in that massive iron i-beams were employed to span the entire width of the building… A mixed retail and commercial building, The Paris Block was originally known as the Eastern Building, and attracted prominent tenants from the beginning. Not long after its construction, the upper floors became the Strathcona Hotel while the ground floor was occupied by Pierre Paris & Sons in 1919. Remnants of the painted signage for both these businesses are still visible on the east and west exposures of the building. This entry was posted on Friday, November 13th, 2009 at 12:43 am	and is filed under British Columbia, Canadian design, design, politics, urban planning, Vancouver. You can follow any responses to this entry through the RSS 2.0 feed. You can leave a response, or trackback from your own site. I always find it so incredibly sad just how far in the hole this area of Vancouver has gone since its prosperous days. What does the Paris Block look like nowadays? I didn’t see any photos at that link that you provided. I didn’t realized that there will be a bridge connecting North Vancouver and Vancouver via a thoroughfare that cuts through the heart of, I think, Downtown Eastside. When did this proposal get approved? I used to be rather up to date what was going on in the DE area when I was doing my undergraduate studies in geography. The downtown eastside is actually a real community but its problems are largely the result of city policy over many decades, a practice of segregation and containment and other policies that continue today. Stan Douglas’ new piece for the Woodward’s building recreates an event in the early 1970s that was an early chapter in this policy – I’ll write about that when it launches. I grew up during the 1950’s in Camp Vernon on the north end of Vancouver Island , The loggers up their wore Pierre Paris boots .. When I grew up and got into Pile driving L.U. 2404 in Vancouver I remembered and went to Pierre Paris around 1980 and bought a pair of really heavy duty boots from them. I have my Dad’s Pierre Paris and Sons boots from the late 70’s or early 80’s(guessing). They have been re-soled many times. I wear them every day to work. I wish I could post a pic.